Foreign direct investment in the local real estate sector is expected to rise in 2016 given the positive property development outlook. “Both foreign and local investors have become more active as liquidity continues to improve and interest rates gradually depreciate. Since the Housing Law and Real Estate Business Law both came into effect on July 1 2015, VinaLand’s projects have received numerous enquiries from foreign real estate investors. 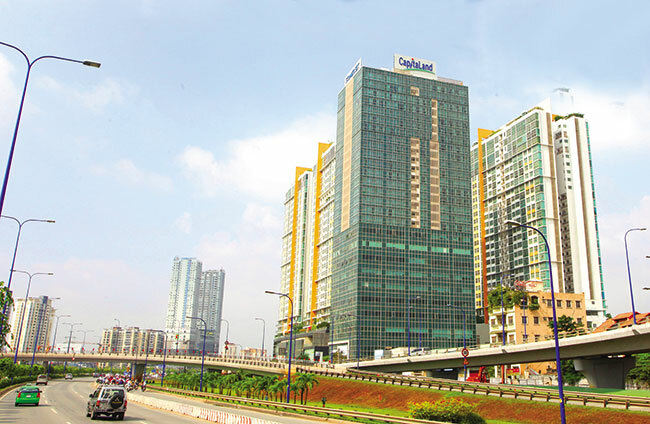 A strong recovery is certainly underway in Vietnam’s real estate sector and this trend will continue into 2016,” noted Blackhall. According to the Ministry of Planning and Investment, foreign direct investment (FDI) inflows to the real estate sector reached nearly $2.32 billion in the first 11 months of this year, almost double year-on-year. FDI for the real estate sector accounted for 11.5 per cent of the country’s total registered investment capital and ranked third after the manufacturing and processing sector. The Thu Thiem New Urban Area received two sizable investments, including $1.2 billion from Empire City Limited Liability Company for the Empire City Complex project, and VND2,000 billion ($91.74 million) from Lotte Group for the Thu Thiem Smart Complex, which is worth roughly $2 billion. Recently, Bitexco forged an alliance with Dubai’s Emaar Properties PJSC to jointly develop a Binh Quoi – Thanh Da urban area worth $1.37 billion in Ho Chi Minh City. “FDI inflows into the realty market accounted for 40 per cent of the total registered investment capital in Vietnam during 2007. When the market became stagnate in 2008, foreign investors registered new projects, but failed to implement them. However, now the upward trend of FDI has returned, and is expected to continue for the foreseeable future,” he added. According to property advisory company CBRE Vietnam, the establishment of the ASEAN Economic Community (AEC) and free trade agreements such as the Trans Pacific Partnership will increase cross-border investments within the ASEAN market. Well-developed markets such as Singapore and Malaysia could offer investors a “core” or “value-added” investment profile, while “opportunistic” investments could be sourced from emerging markets such as Vietnam and the Philippines.